The ski area is approached from three alternative start points, all accessible via the free bus service from Kaprun. The first is the Shuttdorf Talstation which is in the road between Kaprun and Zell am See. This has a big car park and hotel Porschehof is just up the hill. We have stayed here. To get to the lift in the morning you go down and join the queues at the roadside. It is not exactly picturesque. Returning to the hotel you need to come down the final red run or get the lift down. Access to the Zell am See ski area is good however; there is a three stage Arietbahn bubble lift right to the top of the Schmittenh�he mountain. This Arietbahn access route is recommended, if you arrive by bus. This is the main town, down on the flat valley floor, beside the lake. If you stay here try to get a hotel close to the cityXpress lift. Look carefully at the distances so you don't have too far to walk in ski-boots across town each morning and afternoon. This is up a valley into the Schmittenh�he mountain. We have stayed here. The hotels are rather isolated from Zell as the walk is about a mile up/down the hill. 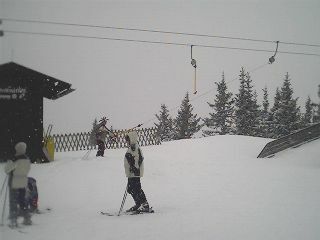 From Schmittental there is an excellent cable car straight to the top. The problem is getting back. The routes from the mountain are mainly just two black runs. If it is cold and there is snow then there is a passable very long gentle blue ski run (route 12) that takes you right to the car park below the cable car. Note where your hotel is in relation to this. We had to climb up loads of steps to get back each afternoon. 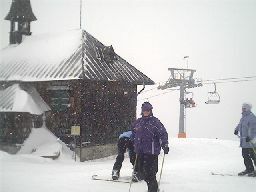 In warmer weather route 12 will lose all its snow and you will need to come down via the black runs or the cable car. Picture above shows the little church at the top of the Schmittenh�he mountain. To get here you either go up the cable car from Schmittental or go up the Arietbahn 1,2,3 and then ski down ahead to a chair lift Kapellenbahn which comes out just to the right of the picture above. It tends to be freezing cold and windy here but there is a wall just behind with a nice warm mountain top restaurant and an outdoor disco and bar with seating and tables. 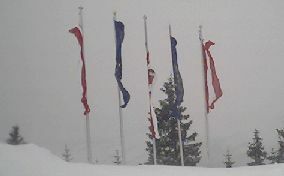 At the top of the Arietbahn ski lift, if you proceed straight ahead you pass five flag poles on the left, blowing in the wind. I have no idea what the flags are supposed to represent. From Kaprun get the ski bus to Areitbahn and at the end of the day come back down there, or if it is cold and you fancy a long gentle run down and have lots of time go down route 12 and get the bus from Schmittental to Zell am See and then change at the central bus depot onto a bus back to Kaprun. If you go past the flags and continue to the left you come to the top of the ski run shown on the left. You would appear in the top right behind the Christmas trees. 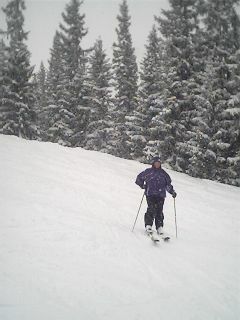 With new powder show this is a really pleasant ski run down. If the weather has been warm and the snow melted this run can be sheet ice in the morning and quite difficult - like skiing on slippery concrete. 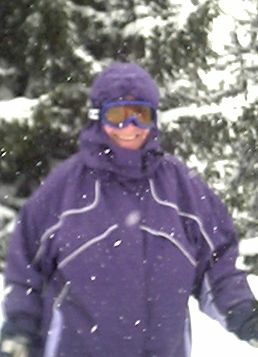 With deep power snow everywhere it was possible to stop easily and so quiet ! From the bottom of this ski run you can either go up on the chair lift to the church at the top of the Schmittenh�he or you can get a medium length drag lift up to the top of an easy blue run that is worth repeating a few times. 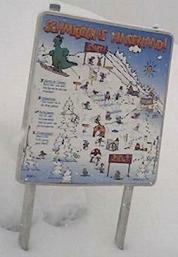 Sign for the children's ski slalom area which is on the left on the way down. Here we are enjoying our ski holiday.